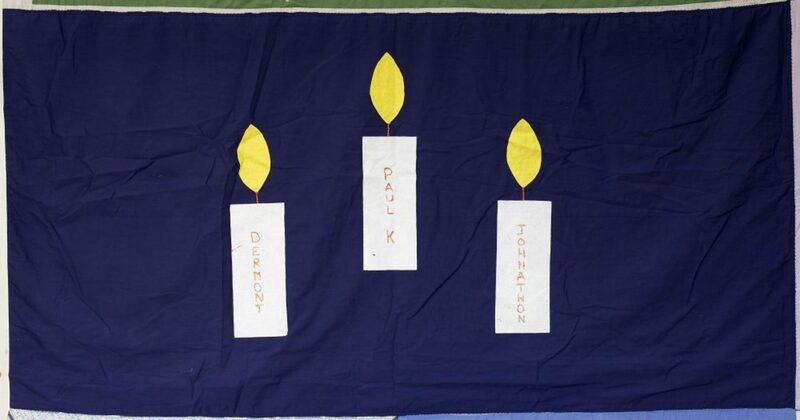 Dermont, Paul K. and Johnathon were all good friends of my brother (Robin Murie). Two of them were New Zealanders, all passed away in Sydney, Australia. I believe that my brother would have created panels for each of them, had he been able. However, due to his deteriorating health, this was not possible. When I created a panel for my brother, I felt it was important to create this other one for his friends, and sew them next to each other, so they would forever be joined in friendship and love. The Quilt has enabled this to happen. I didn’t know these friends in a personal manner. Knowing their likes and dislikes would have enabled me to create a more personal panel for them. So what I have done is used candles with burning flames to symbolise Remembrance, Love, and yes, Loss. Like an eternal flame, they will never be extinguished. I created this panel for my brother, Robin Thomas Murie, for many reasons. To help deal with anger directed at the extended family who weren’t there for him on his “coming out”, who wasn’t there to help and support him through all his AIDS-related conditions, but were all at his funeral. I couldn’t understand. I wrote the ‘corny verse’ and read it at his funeral. I was trying to tell them he had the same ups and downs as the rest of us, he was never any different. Sure, he drove me crazy at times, but he was and will always be my baby brother; someone very special, someone I will always love unconditionally. The colour blue, for one of his favourites. 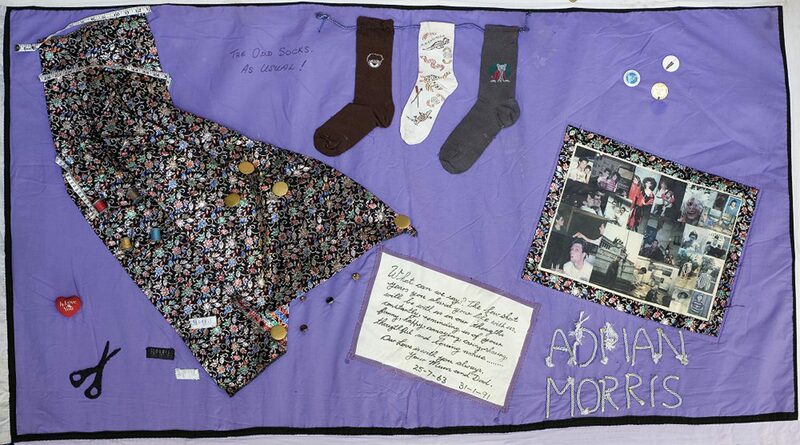 The floral fabric in forget-me-nots, forget him I never will. Flowers, how he loved flowers. The little rainbow for hope, for his eternal peace. The silver and blue braid, just to give him a little glitter because he loved a little glitter in his life. He was certainly one of the world’s gentle people and I will miss him until we meet again. Patrick was born April 8, 1958, in Wanganui. He loved music from a very early age, fostered by his paternal grandfather, Rangitahi Rahuparae, and great-grandmother, Wiki Pumipi, singing to him as they nursed him while a baby. He moved to Hastings at the age of 2 with his family. His interest in music grew, and at age 5 his Auntie Kura gave him a piano. He loved this and when it was time to take lessons his teacher felt he had a natural talent. He was already playing by ear and could play whatever she showed him. He learnt to read music enough for him and then switched to guitar – electric and acoustic. He then formed a band while at the high school called “Bare Footed Flunks”. He was also a secondary school rep in athletics for Hawkes Bay. He continued to improve and then moved to Wellington and played a big part in forming bands down there, these being “Make”, “Xit” and “Exodus”. His playing became well known and in 1984 he auditioned and moved to Sydney to play for Tukitimu Trust in nightclubs. He continued to experience many forms of music, and came back to Hastings in 1987 and assisted with music schemes. He also became well known as a lighting and sound expert and assisted at many big venues, notably Sesqui, The Hui Aranga, and the Ratana Music Hui, plus taking part in Maori Culture. He joined “Zig Zag” and travelled with them. He also toured with Davinius, Eddie Low and the Drifters. In between these tours, he went home to Ohakune and formed his own family band “Blue Steel” which did many Maori and Polynesian shows in the central and lower North Island. His preferred styles of music emulated Stevie Ray Vaughan and Gary Moore, plus other greats like Jimi Hendrix and Eric Clapton. His work, his hobby, and, indeed, his whole life was dedicated to music. He enjoyed the pleasure it gave to others, often playing without any monetary reward. And this is how we remember Paddy, in the sharing of the great talent he had. He died at Napier Hospital on November 21, 1990. 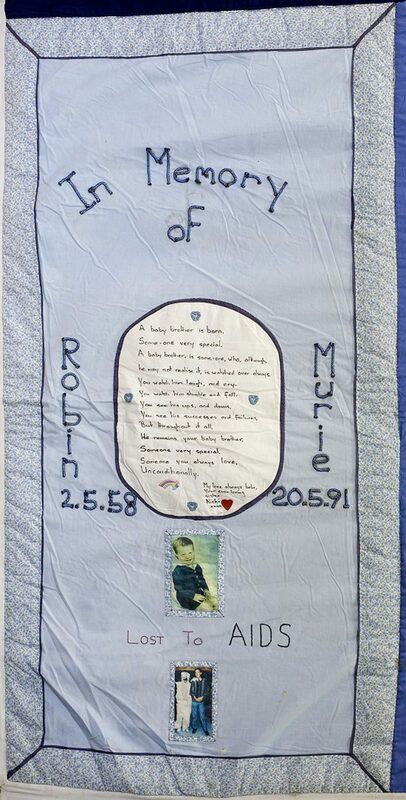 Written by his mother, Mrs Claire Robinson, Hastings. 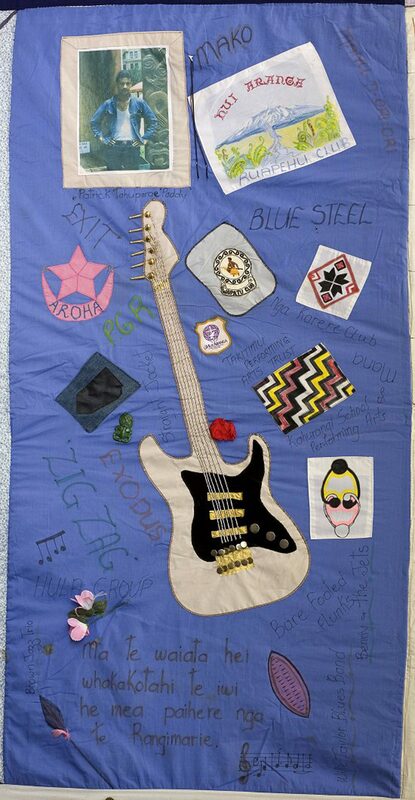 This Quilt was made to honour the man and his music. 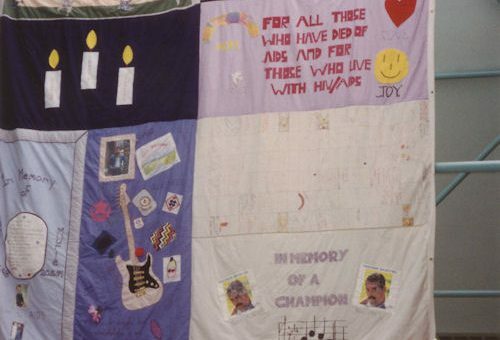 Freddie’s Quilt was made just before Christmas 1991, only a couple of weeks after his death. Warren Butler was a real fan of Freddie’s and came up with the idea of doing a fundraiser using Freddie as the ‘draw card’. 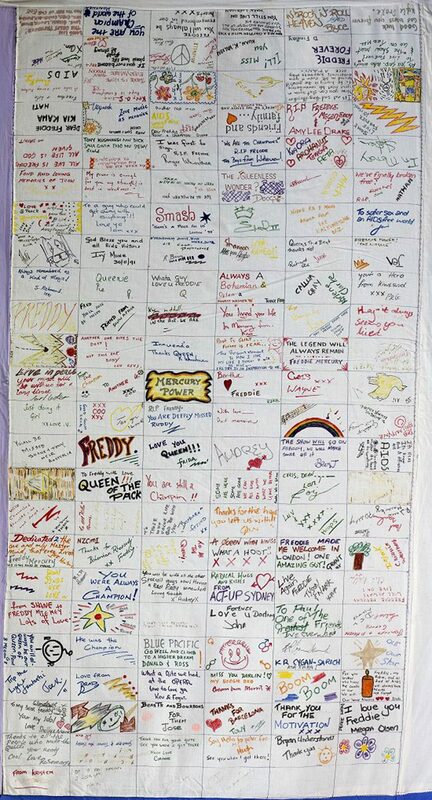 This Quilt was made along with one divided into 144 squares (Sharing The Challenge – see Panel above this one on this block). 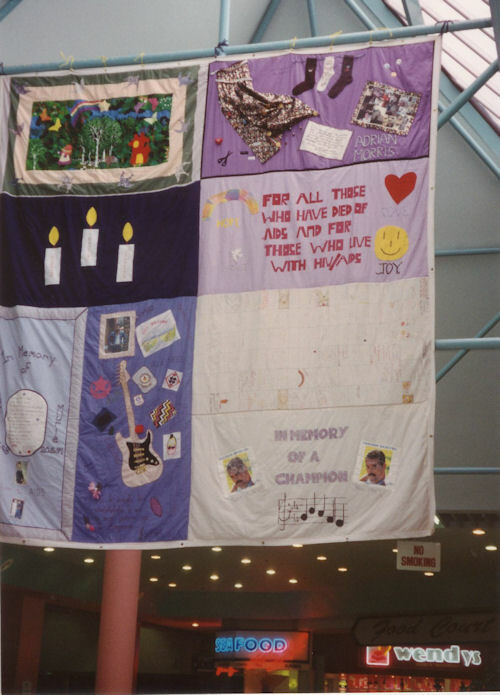 Both were taken throughout Auckland and in exchange for a $5 or more donation, people could write into a square their reflections about Freddie and his music. Warren raced about to 2nd hand shops and record shops looking for a record cover to put on the Quilt. In a state of exhaustion, he finally found one, and a really appropriate one it was too, “I Was Born to Love You”. That’s how Freddie felt about his adoring fans and how his fans felt about him. Freddie was the lead singer of “Queen” and for 20 years remained popular. Songs such as “Bohemian Rhapsody” will, no doubt, live on forever. We decided to keep the Quilt plain and simple. Bryce inscribed the music symbols and lettering. Megan filled in the colouring and helped to sew. 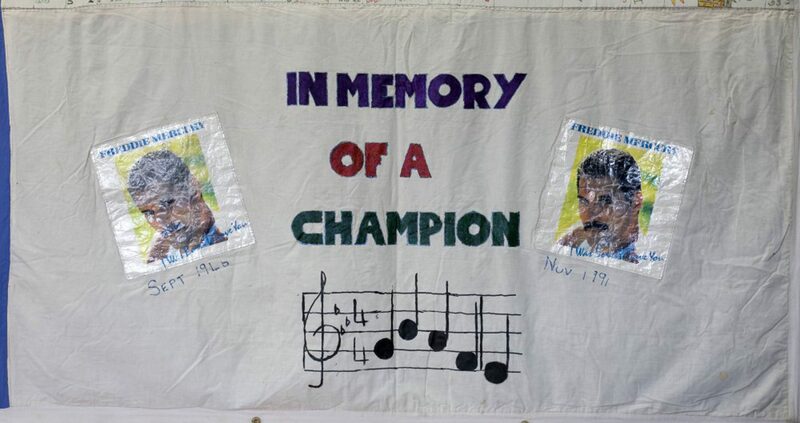 Freddie and his music will live on in our hearts for a very long time and those of us that remain will continue to see “The Show Must Go On” in the fight against AIDS. 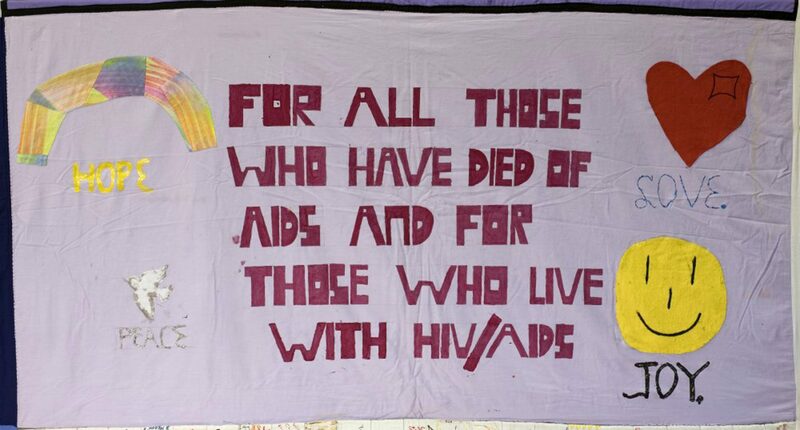 That Freddie told a stunned world he was HIV positive the day before he died shows this epidemic still has a stigma of fear. 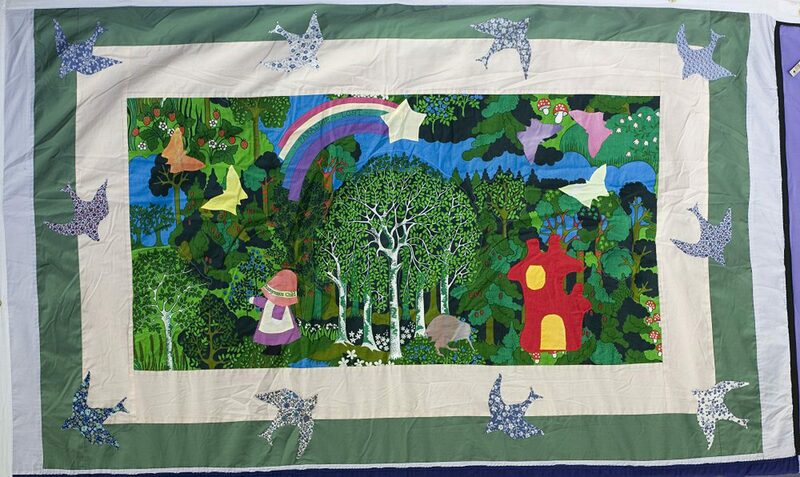 This Quilt was made with love and lots of happy memories. Block image is made up of images of the individual panels placed in their correct position on the block, so seams, edges etc. may not line up correctly. Get in touch with us to add memories to an existing panel. Interested in exhibiting a block? Get in touch to enquire. We’re raising needed funds for HIV awareness and education.